I am currently in-house for my last semester of optometry school. 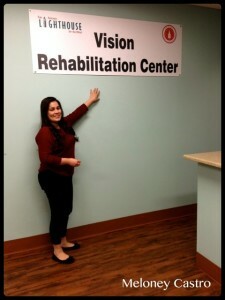 My in-house semester consists of rotations through Bowden Eye Care and Health Center, CommuniCare Health Centers on Callaghan and in Kyle, San Antonio Lighthouse for the Blind, and the contact lens clinic and the vision therapy/electrodiagnostic clinic at the University of the Incarnate Word Eye Institute. 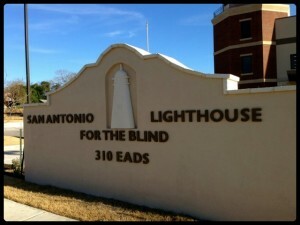 My first and current rotation is at the Low Vision Rehabilitation Center at the San Antonio Lighthouse for the Blind. 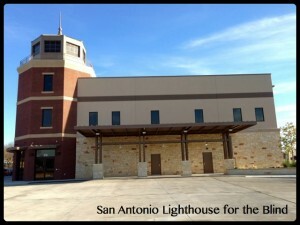 The center is in a new building that was unveiled this past fall. 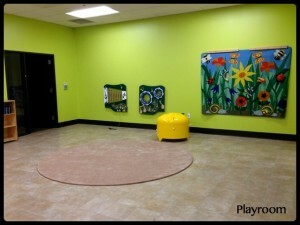 The new building also has a low vision store, library, playroom, technology room, conference room, other Lighthouse program rooms, and a production facility. 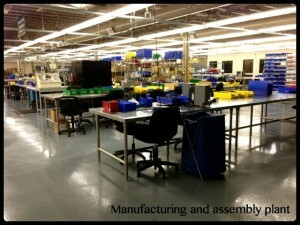 The Lighthouse employs legally blind or visually impaired individuals at the production facility who manufacture and assemble items such as mechanical pencils, rollerball pens, highlighters, aerospace insulation blankets, and other textile apparel items. Every morning, my clinic group and I walk through the manufacturing and assembly plant to get to the Low Vision Rehabilitation Center, and it is really inspiring to see the employees hard at work. Some employees have multiple impairments, such as visual and hearing, yet they do not let their impairments hold them back from working and being self-sufficient. 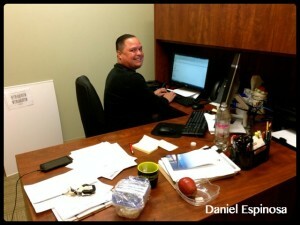 It is great to see these individuals enjoy and succeed at their jobs. As interns, my classmates and I are able to provide comprehensive eye exams and low vision evaluations for patients at the Low Vision Rehabilitation Center, many whom are Lighthouse employees. The Low Vision Rehabilitation Center has very friendly staff members. Daniel Espinosa, the Low Vision Clinic Manager, and Meloney Castro, the medical receptionist, are great to work with, and they both love working at the Lighthouse. We are also fortunate to have four different low vision specialists who we get to work with during our rotation at the Lighthouse: Dr. Nancy Amir, Dr. Christopher Choat, Dr. Stephanie Schmiedecke, and Dr. Matt Valdes. Each doctor has many years of experience in low vision, and I find it very helpful to learn from each doctor’s different style of practicing and teaching. Low vision is often an overlooked specialty of optometry, but it can definitely be a rewarding field of practice. My classmate and I recently saw a patient who was diagnosed with age-related macular degeneration several decades ago. He had canceled his newspaper subscription since he was no longer able to read it. After a low vision evaluation, my classmate and I were able to prescribe the patient a pair of spectacle microscopes in order to read newspaper print comfortably again. The patient was so ecstatic when he was able to read a newspaper that he thanked us profusely. 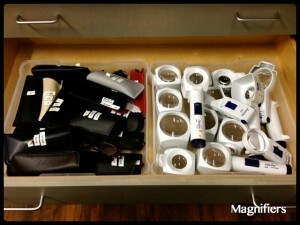 This was definitely one of my highlights as an optometry student. One important thing that I have learned is that although optometrists may not be interested in providing low vision services, they should be aware of the benefits of such services and refer to low vision specialists when appropriate. I have heard several patients remark on how they wish someone had told them about low vision services sooner and how happy they are to find that such services exist. The San Antonio Lighthouse for the Blind is a great organization, and I am glad that I get to rotate through the Low Vision Rehabilitation Center. Preparing for NBEO Part III – Almost There! It’s finally here—my last semester of optometry school! Four years have certainly gone by quickly. Graduation is in May and just around the corner, but I don’t think it has really hit me yet since I’m still in school mode. My current focus is Part III of the National Board of Examiners in Optometry (NBEO) exam, which I have registered to take in the beginning of February. The NBEO administers three comprehensive examination Parts or “National Boards.” Each optometry college/school has different graduation requirements and each state has different licensing requirements regarding the attempt and passage of each NBEO Part. Part I is Applied Basic Science, Part II is Patient Assessment and Management, and Part III is Clinical Skills Exam. For Part I, I mainly used my lecture notes and the KMK Part I lecture courses, review textbooks, and online study resources to prepare. 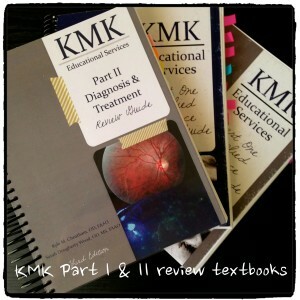 For Part II, I mainly used the KMK Part II review textbook and online study resources to study. For Part III, I am utilizing the school’s practice rooms, which are fully equipped to simulate the NBEO testing rooms in Charlotte, NC. 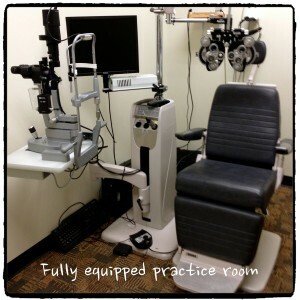 RSO has two practice rooms at the Eye Institute and two practice rooms at the Bowden Eye Care and Health Center. 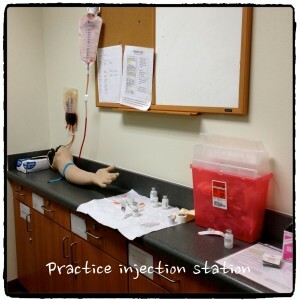 During the summer of our third year of optometry school, we are required to pass an injection proficiency. Since it may be a long time between the injection course and taking Part III, Dr. Ramona Parker, one of the nursing professors who teaches the course to optometry students, offers occasional practice sessions on injections at the Ila Faye Miller School of Nursing and Health Professions for those who want a refresher on the procedures. I am taking Part III on the same day with four other classmates so we have been practicing together throughout the week after our regular clinic schedules. We have found it very helpful to have one person sit as the patient, a second person perform the skills as the doctor, and a third person acting as the examiner/proctor. Having a third person act as the proctor has been helpful because of the feedback based on observation and completion of the evaluation forms, which are available on the NBEO website. National Boards for any profession can definitely be intimidating and overwhelming, but the many hours of preparation and studying will be worthwhile when you find out your time and commitment have paid off in the end. Author Linh PhanPosted on January 27, 2014 January 27, 2014 Categories Linh PhanTags kmk, National Board of Examiners, national board of examiners in optometry, nbeo, nbeo certification, nbeo testing rooms, Optometry, optometry school, San Antonio, san antonio optometry, state certification, Texas optometry, texas optometry school, UIW Rosenberg School of Optometry, UIWRSO, University of the Incarnate Word, university of the incarnate word rosenberg school of optometry1 Comment on Preparing for NBEO Part III – Almost There! Jan 17, 2014 — This year’s American Optometric Association (AOA) Presidents’ Council Meeting was held in San Antonio, at Bowden Eye Care & Health Center on 2547 East Commerce Street. 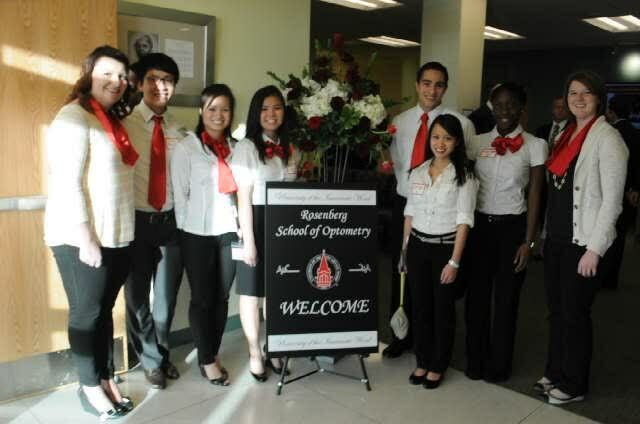 The UIW Rosenberg School of Optometry did an amazing job hosting this event! I was blown away at how they made the Eye clinic so festive! The theme of the event was “fiesta,” a Latin flare blew through the building as the San Antonio all female mariachi band, Las Coronelas, danced and sang. All the state optometric leaders came in by bus around 6-7pm. RSO students in bright red scarves and ties greeted the special guests by giving a tour of the building. The Bowden Clinic is one of RSO’s newest additions – a 30,000 square-foot modern public health care facility, which serves the vision care needs of residents on the Eastside and surrounding areas. 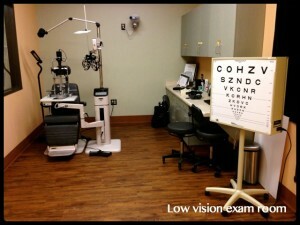 Patients are seen by licensed eye care doctors and student interns from UIWRSO. Waiters served hors d’œuvres on the first floor; where the lobby and optical was open for the doctors to talk and mingle. Greeters may bring guests upstairs to feast on more Tex Mex food. My favorite was the cheese and bell pepper quesadillas! When I went upstairs to take pictures, I had a great time talking to Dr. Chapman, O.D., M.S., F.A.A.O., Director of Clinics at the UIW Rosenberg School of Optometry, and he showed me all the new equipment housed at this facility. 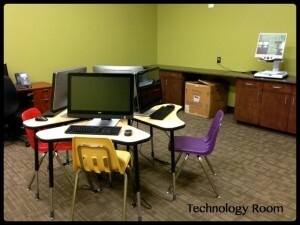 I’m very excited to have the opportunity to work with all of the state-of-the-art equipment. Afterwards, I had a lively chat with the state optometric leaders from Pennsylvania. Dr. Marianne E. Boltz, O.D., F.A.A.O., President of the Pennsylvania Optometric Association, was delighted to hear that I was interested in Pediatric optometry, and told me all about her active experiences in optometry school and with American Optometric Student Association (AOSA). Just before I left, Denisse Lopez, Class of 2016 and AOSA RSO Trustee 2014-15, said “I want you to meet someone.” So I went downstairs and met up Denisse and Raelyn Ottenbreit UIWRSO Trustee 2013-2014, and they introduced me to James Deom, PCO-Salus, AOSA 2013-2014 President, Devin Sasser, UMSL College of Optometry, AOSA 2014-2015 President, and Robert Foster, AOSA Executive Director. They are a charismatic group and were very attentive when I told them about my passion for COVD and my hopes of getting more involved with the AOSA! The First Annual Talent Show was hosted by the Student’s Volunteer Optometric Services to Humanity (SVOSH), RSO Chapter. This event could not have been possible without the hard work and preparation of Hayley George, RSO SVOSH President, and the SVOSH officers. Proceeds were donated to support the Philippine disaster relief and the victums of Typhoon Haiyan. 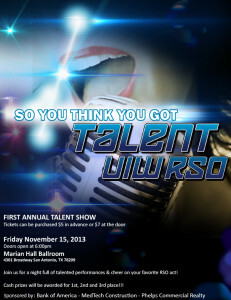 The event was held in Marian Hall Ballroom at the UIW Main Campus on Friday, November 15th. Dr. Foutch , O.D., Ph.D., F.A.A.O. I was so happy to receive my first box of contact lenses from UIWRSO! So what took me so long? To be honest, I was afraid of contact lenses – the thought of shoving foreign objects into my precious eyes, led other fears – what if they got lost? What if I forgot to take them out? Corneal scratches? I’m sure there are other patients who are afraid to try them out; so allow me to share how that fear was abolished. Step by step, the student intern explained what he was doing. I was familiar with the refraction process but when the intern started to instill fluorescein drops for the contact lens fitting, that was beyond what I have learned in my second year of optometry school. The student intern was happy to answer all my questions and even gave me some explanations for the things he did; it was nothing but great peer-mentorship. So what abolished my fears of contact lenses? It was nothing more than simple patient education. Second year was also the year that I joined the Contact Lens Society at the Rosenberg School of Optometry. I find it beneficial to join many clubs because I love to hear from doctors and how they excel in their field of expertise. UIWRSO Student orgs (Contact Lens Society and Private Practice Club) hosted a Contact Lens Private Practitioner Forum on Monday, Nov 11th. An exceptional panel of 3 doctors (Drs. 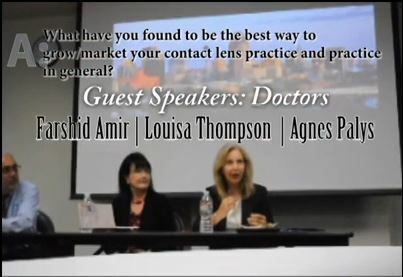 Agnes Palys, Louisa Thompson, and Farshid Amir) was at RSO to answer questions and discuss topics related to managing a contact lens practice, CL residency, keeping up with contact lens advances, and private practice pearls. Some of these doctors are externship preceptors so this is a great opportunity to get to know them and learn about private practice management, especially relating to contact lens. This video is a highlight of this 2 hour event. I picked four questions out of many that were helpful for me. I hope you enjoy the video! What have you found to be the best way to grow/market your contact lens practice and practice in general? Please share advice/a pearl with students about owning a private practice that you wish you had known early on. How do you keep current with all the new advances with contact lenses as well as their different innovative uses? (Any sources for this info that you pay attention to over others? What can a private practice owner expect to see as a potential increase in profit by switching from only basic CL fits to adding specialty CL fits, in your experiences?